Write Results is a program that has nothing to do with your web search results. Instead of helping you surf the web in a more efficient manner, this advertisement-supported program showcases suspicious pop-up and banner advertisements. These ads are untrustworthy, which is the main reason we suggest deleting this adware from your PC. Do you know how to remove Write Results from your browsers? Luckily, you do not need much experience to delete this infection. According to our research, Write Results is a clone of Internet Blast, Record Page, Package Return, and hundreds of other SuperWeb LLC ad-supported programs. These programs also require removal, because they are just as unreliable. SuperWeb adware allows unpredictable adware servers to inject advertisements on the websites you visit, and there is a great risk that these ads will jeopardize your virtual security. Unfortunately, many users postpone the removal of this adware. Computer users would not install Write Results if they knew how dangerous it can be. Due to this, the creators of this adware have created mywriteresults.com. 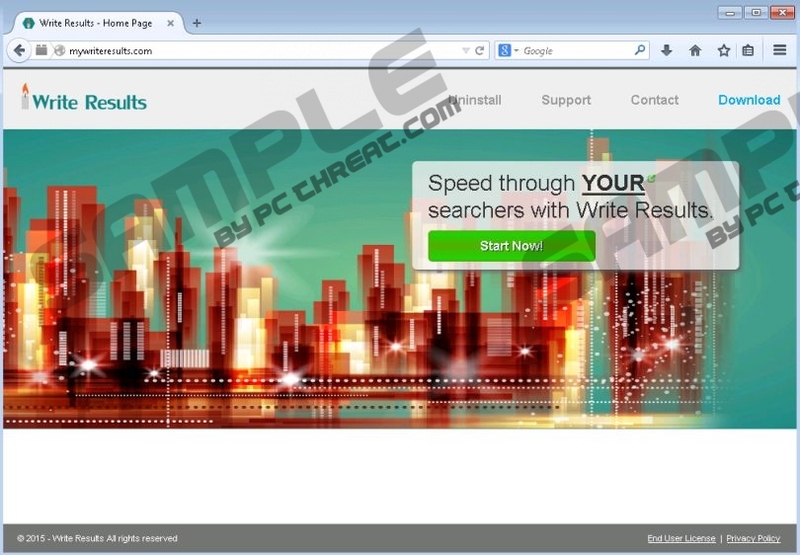 Even though this site does not offer a working installer, it provides information about Write Results. The goal of this website is to convince users that Write Results is a reliable program that can offer beneficial services. Would we advise you to remove this adware if we were not certain that it was dangerous? Of course we would not! You need to delete this adware to protect your own virtual security. Even though the advertisements presented by Write Results (e.g., "Ads by Write Results") might look appealing, it is not wise to interact with them. These advertisements are presented by parties that might not have your best interests in mind. They might use Write Results to boost traffic to suspicious websites or expose you to phishing scams and malware installers. If you do not delete Write Results from your web browsers, these are the risks you will encounter. In the eyes of our researchers, the removal of Write Results is the only option you should consider. You do not need experience to delete Write Results from your operating system. Simply uninstall this adware from your operating system using the guide below. Chances are that this will be enough to remove Write Results from your PC, but we cannot say the same about the infections that could have been installed with this adware. We suggest trusting automatic malware removal software to delete the remaining infections. Click the Start icon on the Taskbar to open a menu. Launch RUN (simultaneously tap keys Win+R). Go to Uninstall a program and right-click Write Results. Quick & tested solution for Write Results removal.